Amy McHugh was an energetic elementary school teacher, teaching 1st graders in a small rural town in Pennsylvania. As her family grew, she decided to stay at home with her four precious children. Always wanting to stay busy, Amy ran a successful business from home. She earned national recognition and travel incentives for her sales achievements, ability to manage others and motivation to achieve goals. 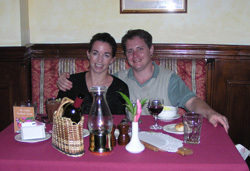 Mike, Amy's husband had a BSME from Johns Hopkins University and an MBA from Penn State. He worked as an Engineering Manager at the largest printing company in the world. Amy has had a passion for travel ever since she was a small girl. With her family she traveled to the Caribbean, Dominican Republic, Europe, etc. at least 20 times. When she got married to Mike, she continued her travel passion with her new family. Amy's mom, Ann Grubbs, was one of the top producing luxury cruise specialists in the US. Ann worked endless hours making sure her client was always satisfied. Her passion for client satisfaction and long work hours were legendary in the business. Amy was trained by the best travel agent in the travel industry and also has had years of travel sales and service experience working for a high-volume travel agency. Her mom would say, "Amy. The client's needs always come first above all else. If you want the client to return, you must make it easy for them. Make it as easy as possible for them and give them the experience that they have always dreamed about." A few years ago, Amy's mom was diagnosed with cancer after being ill for months. Amy assisted with Ann's large client base while she received treatments. Sadly, Ann passed away from lung cancer that very same year. Her Dad Roger also passed away three months later. Dream Makers Vacation Services was created in Ann and Roger's memory soon afterwards. Since then, our staff has quickly won national sales awards and earned many travel certifications and degrees Sandals Certified Specialist, Couples Resort Specialist, AMR Master Agent and the Disney College of Knowledge to name a few. In 2007 & 2008, Dream Makers Vacation Services received prestigious, international awards at the Travel Impression's Best of the Best Awards and the STAR Awards for Sandals/Beaches Resorts. Our dynamic business has helped dreams come true for thousands of satisfied client's, from all over the US, Canada, the UK, and Ireland. Ann's dream and passion for travel lives on through our award-winning business. We look forward to making your travel dreams come true as well!